Where did the summer go? 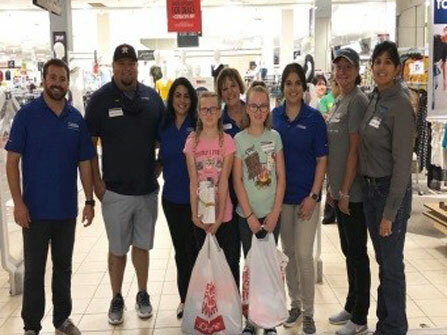 In a blink of an eye, we were preparing for our Stuff the Bus event in partnership with H-E-B. It was amazing. Many students and volunteers gathered at our H-E-B sites and rallied the community to Stuff The Bus! The community responded, and we so filled the buses, and now we are ready to provide the students with the supplies as they need it for the first day of school and beyond. The ChildSpree was another great success. This year we celebrated our 13th year shopping with students. CPL our presenting sponsor provided $7,500. Cheniere Care came in at $2,500, and JCPenny’s Foundation came in at $2,500. We had 72 volunteers, and it was such an energetic event. The students and volunteers were all so excited to take part in this event!! Last but certainly not least, CIS students and families were able to receive free shoes from PayLess. CIS is so grateful for the opportunity of inviting 300 students to gather at PayLess on Tuesday, August 22, 2018. Each member of the family that attends Pre-K through middle school was able to qualify for the shoes.